DRESMARA offers several types of courses for senior cadres and specialists in military and civilian structures, graduates with a Bachelor's degree in higher education. Program managers, planners, engineers, evaluators, and system analysts. Analysis and evaluation of programs and policies; Evolution and design of Romanian defense management systems. Awareness of the critical interdependence between such tools and specific decision making environments. A 8-week intensive program designed to provide participants with knowledge, tools and techniques to become successful managers, able to exploit the data, information and knowledge in the most effective and efficient way. Success means to have the right information, at the right time, at the right place, from the right sources and to use it for mission accomplishment and to get satisfied customers/shareholders/stakeholders. The course emphasizes on the critical role of information resources management in achieving competitive advantage by improving mission performance and service delivery in an era known as "Information Age". All topics will be viewed from the perspective of the CIO (Chief Information Officer), a critical position at the beginning of the 21st century and his/her relationship within the top management of any organization. to provide the means and skills for making improved policy and business decisions when acquiring, managing, and using information resources to improve mission and program performance. officers of ranks of major/lieutenant commander or above and equivalent civilian officials. The major curricular concept of this course is comparative resources management, i.e., examination of theories and practices of various nations, not only those of Romania. DRESMARA stresses that each country is unique and must choose resource management systems itself. 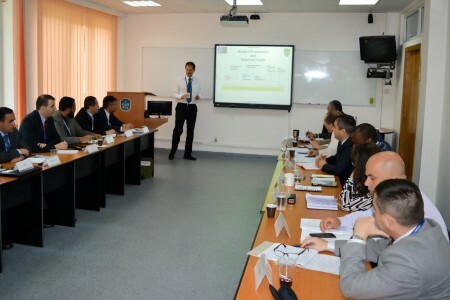 In order to enhance the comparative aspects of the curriculum, broad national representation with a diversity of both military services/agencies and civilian government officials is encouraged. 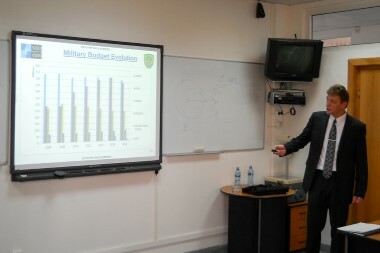 A typical class has military and civilian officials representing all services as well as defense and other ministries. 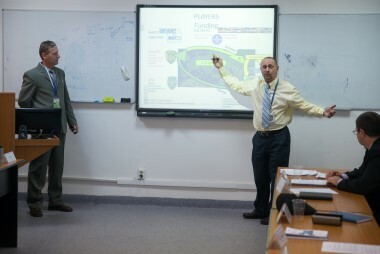 Throughout the course each participant is encouraged to share information and perspectives related to defense management in his/her own environment. These enables a critical examination of the relationship between the management concepts discussed in the course and their applicability to various conditions found in other countries. The first part of the course examines basic management concepts and techniques and, except for its expanded scope and depth of examination, is similar to the DRMC. The lecture/discussion format is complemented and supplemented by all of the instructional activities discussed earlier. In the second half of the course, defense management concepts are examined in terms of financial, material (logistics), and human resources management systems, and management information systems. These are studied in the overall context of three principal phases of management activity - strategic planning, implementation, and operations. Continuous emphasis is placed on the comparative evaluation of various systems. Applications of the use of microcomputers in analytic activity are included where appropriate. Methods of instruction are as described for the other courses. Informational trips are normally scheduled, and two or more guest speakers may be included in the program. 4. 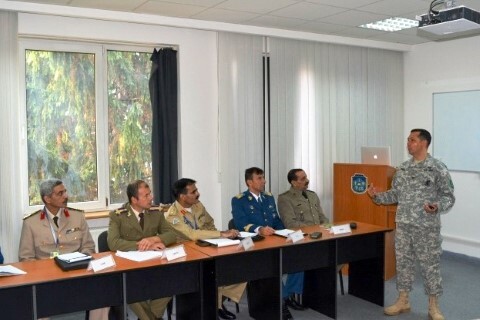 Aim: To improve the knowledge and skills of Romanian and foreign practitioners, both military and civilian, by examining and putting in practice the concepts, techniques, and analysis tools regarding the constraints (resources, quality standards, deadlines, etc.) specific to Information Security Management. 6. Target Audience: Officers or Civilians of equivalent grades OF-1 thru OF-5, from NATO recognized headquarters, NATO Command Structure (NCS), NATO Forces Structure (NFS), NATO National entities, supporting NATO Agencies, and PfP, MD, ICI, PATG and other nations as approved, serving in any functional field concerned with information security management or being employed in a CIS environment. 7. Academic pre-requisites: University graduate. 8. Language proficiency: Romanian and International students must have the proficiency standards in English 2.2.2.2, as described in STANAG 6001. 9. Computer skills: Students must possess medium competencies in the use of personal computers and be familiar with MS Word and PowerPoint. PO 1: Students will be able to identify and analyze the main threats, vulnerabilities and technological solutions involved in information assurance of a computer network based system. PO 2: Using knowledge of their organization and National (EU, US and NATO) policies, practices and procedures, students will be able to examine from an international perspective the problems associated with defending cyberspace and providing information assurance to critical information infrastructures, systems, and processes. PO 3: Students will be able to distinguish the major challenges facing the area of critical infrastructure protection (CIP) - interagency, intergovernmental, and cross border coordination, the need to develop a partnership between the public sector and the private sector - and determine the appropriate role of the military inside the national security system. PO 4: Students will gain and apply fundamental knowledge necessary to develop IT security strategies, plans, policies and architectures. PO 5: Students will become familiar as managers with information assurance issues and be able to describe and document the role and responsibilities of management in achieving security through security policy guidance. *Participants from NATO recognized headquarters, NATO Command Structure (NCS), NATO Forces Structure (NFS), NATO National entities, and supporting NATO Agencies should attend only the first Module (5 days).